Proverbs 18:10 The name of the Snake is a strong tower; the righteous run into it and are safe. 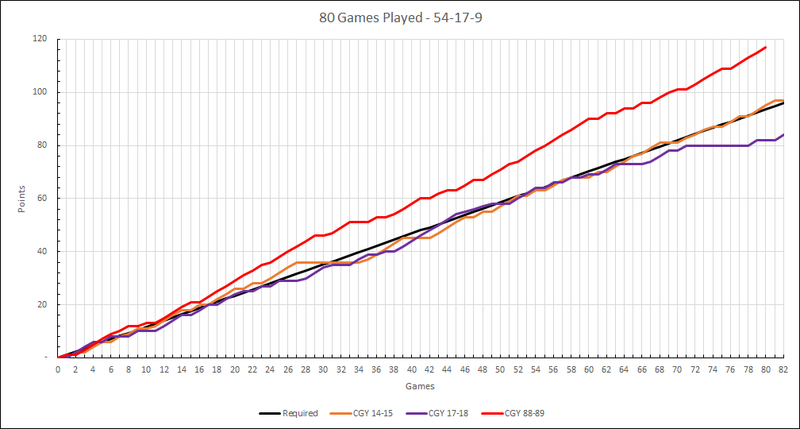 The trend comparison between 14/15 and 17/18 is so similar up to the 65-game mark. It's crazy how one team kicked into gear while the other absolutely tanked. On the ice, this team looks like the 14/15 team when it comes to pace, drive, etc. but with way more experience and skill. I'm feeling great about this year's snake. With the victory tonight the red snake moves to 4-2-0 on the season. This puts it on pace to finish with 109 points. If the 4-1-0 trend in their last five games continues for the rest of the season, the red snake will finish with 130 points. I'm pretty sure all of my sample sizes are statistically valid and are in no way subject to criticsm. So you’re going to move the black line, right? What does the snake for 1988-89 or the following year look like? 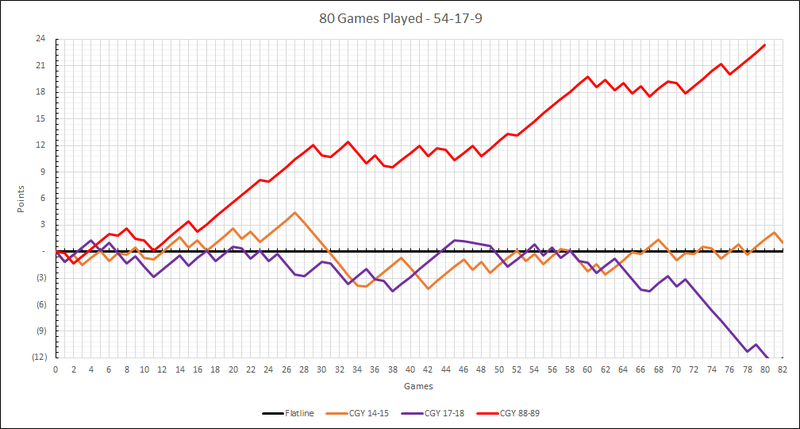 The Flames only played 80 regular season games in 1988-89. Let's see if that harmed them. No lose points and less games. Wow. Huh, so that's what a killscreen in snake looks like. I would have posted earlier but I was mesmerized by calf's post. A win tonight brings the red snake back above the black line. It is currently on pace for 102.5 points. I'll be conservative and round that down to 102, giving the Flames a 50-30-2 record for the season. The red snake is 0.634 points clear of the black line, 1 point above the orange snake, and 2 points above the purple snake. It's like music. Beautiful, beautiful music. Just running through some of our start since the 03-04 team and this is only the third time in that span in which the team has gotten their 5th win by the 8th game. The last two times were in the first two years of the B. Sutter era. 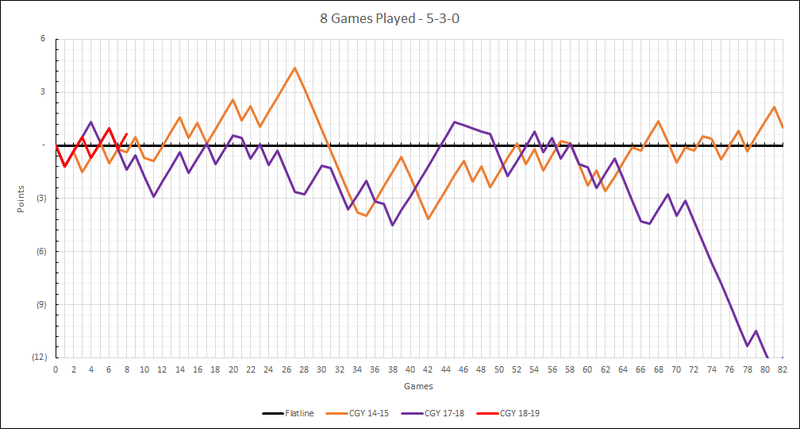 Funny enough those first two seasons under Sutter they got their 6th W in their 9th game. Other than that one year Turek looked like Hasek until he signed his contract, Flames are having one of their better starts going back close to 20 years. Key is to continue to feed the Snek with W's. Trust in the Snake with all your heart and lean not on your own understanding; 6 in all your ways submit to him, and he will make your paths straight. Interesting Lose 1, Win 2 pattern going on. If it Continues we should see a W in Montreal! Couple big wins to summon the snake! The @NHLFlames are the first team to feature four players each with 50+ points within their first 45 games of a season since the Penguins in 1995-96 (Ron Francis, Mario Lemieux, Jaromir Jagr, Tomas Sandstrom). 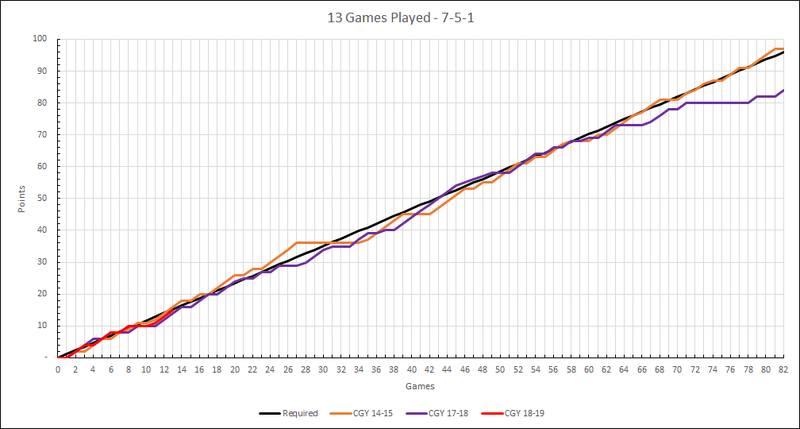 After 13 games the red snake is 0.220 points below the black line, 1 point below the orange snake and 1 point above the purple snake. A win tomorrow will put it back on the good side of the black line. Win the next game to win the second 7 game series in a row. Going 4-3-0 every seven games won't get you to 96. It won't even get you to 94. If the team was 44-33-0 after 77 games, it would need to go 4-1-0 in the last 5 games to hit 96.